A young biologist was sitting on a stump at the edge of their camp. On his face was the saddest hangdog expression. One of the other biologists saw his sad looks and asked, "What's the matter?" 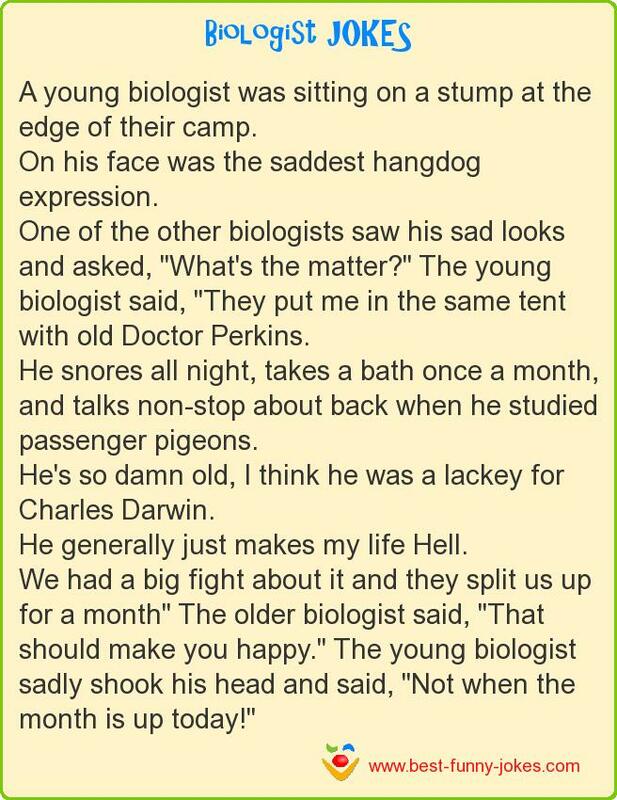 The young biologist said, "They put me in the same tent with old Doctor Perkins. He snores all night, takes a bath once a month, and talks non-stop about back when he studied passenger pigeons. He's so damn old, I think he was a lackey for Charles Darwin. He generally just makes my life Hell. We had a big fight about it and they split us up for a month" The older biologist said, "That should make you happy." The young biologist sadly shook his head and said, "Not when the month is up today!"